Internet users are growing more demanding and less forgiving, according to the results of a consumer survey from Apica. Nearly 40 percent won’t wait more than ten seconds for a website to respond before navigating away. Apica conducted the survey among internet users in the UK, US and Sweden, to investigate changing attitudes towards a brand’s digital performance. The survey of 2,250 consumers reveals that nearly 40 percent won’t wait more than ten seconds for a website to respond before navigating away. One in nine users (11 percent) won’t even give a site five seconds before moving onto another website. The survey also found that digital disappointment affects brand loyalty, with 60 percent of consumers likely to be less loyal towards a brand if they experience poor website or app performance. Ten percent of participants said they would never return to an offending brand for goods or services. Swedes are least loyal towards a brand that lets them down online, with 73 percent likely to turn to competitors. The survey also revealed that users also have limited patience for organizations that schedule maintenance on websites and apps. Less than half (46 percent) of users said that several hours of downtime was acceptable, and even then, reasons for the downtime had to be properly communicated. 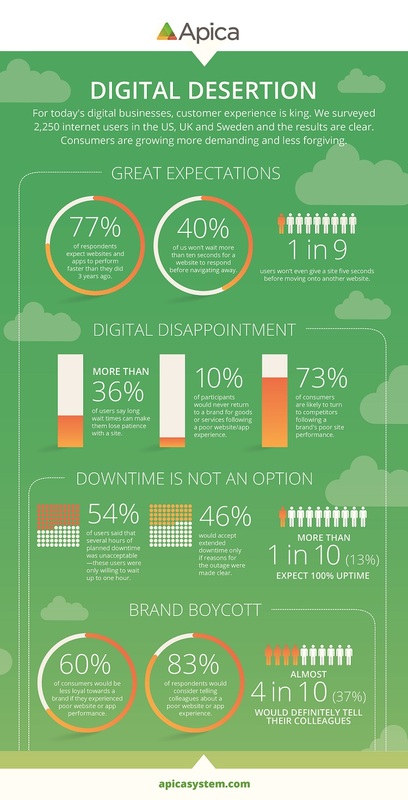 54 percent respondents had an "upper limit" of one hour, and more than 1/10 (13 percent) actually expect 100 percent uptime. Negative digital experiences are also likely to impact brand reputation with 83 percent of global respondents reporting they would consider telling colleagues about a poor website or app experience, and almost 4 in 10 would definitely share this. “If companies wish to retain both customers and revenue, they must focus on proactive performance testing and monitoring of their digital services to ensure that, even at peak times, downtime does not occur,” added Carmen.